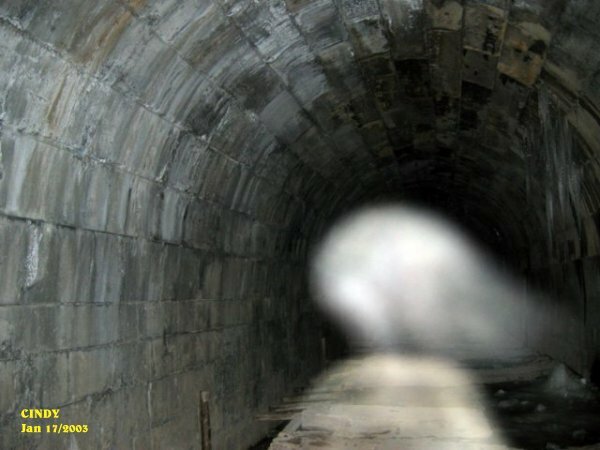 In the middle of the tunnel it appears to be a person wrapped in a robe in ecto form. On the right hand side, you can see a ghost dog laying down by the wall. Just to its left by its head you can make out a form of another dogs head that appears to be looking at the larger dog laying down. This photo shows a strong energy form of a person that seems to be bending or hanging from the wall with the head nearly to the ground. 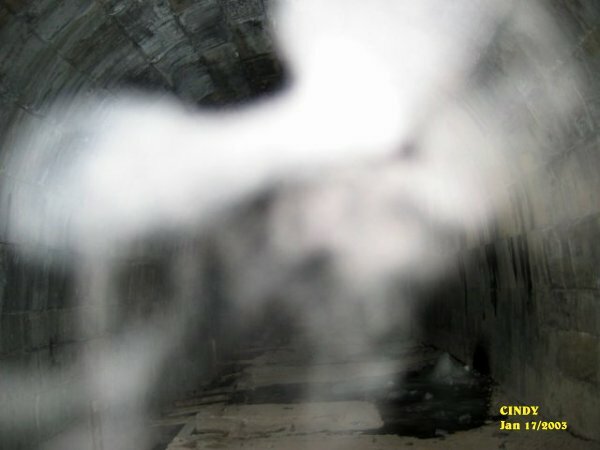 No forms of anything in this photo, but it does show a lot of energy that seemed to be getting ready to form into something in the center of the tunnel. 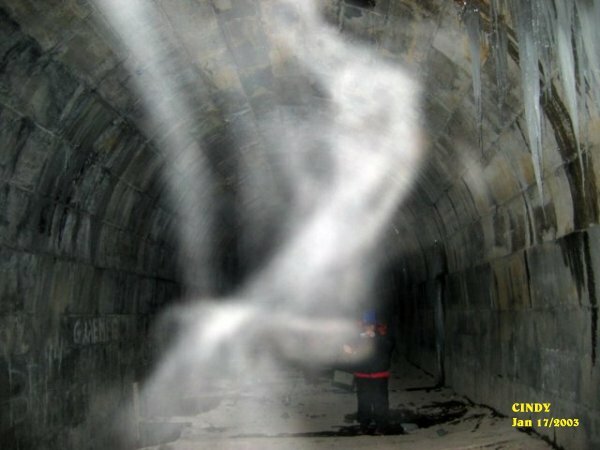 It appears that a spirit of a woman with shoulder length hair was walking away from Cindy when this picture was taken. This was a very good shot of blue ecto plasm fully energized into strands of energy. At first glance the energy strands appear to be of a stick person bending over. Was this the intent of the spirit? These type of photos are hard to catch for they are uncommon in most photos. 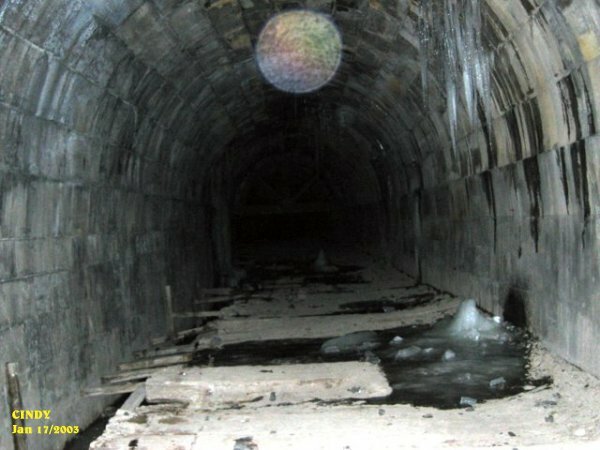 The ORB you see in the center of the tunnel had a very vibrant color to it. You can also tell this was a large ORB. This ORB (or also known as a ghost sphere of light) had a lot of energy to its make up. The different colors that it had made this an ORB to be seen. This night produced a lot for us. We found that by calling out the names of the dogs and the persons that may occupy the tunnel it produced a lot of activity. The name Tucker produced a presence when called upon. The name came up on one of our sessions with the OUIJA board. We do not know at this time if the name is that of a person, or if it is a nickname, or that of an animal. We do suggest to anyone that goes to the tunnel to try calling out the name TUCKER and see what happens. Please post on our message board if you should experience anything by calling out the above name. We were surprised to see that a lot of activity came about when we started calling out the names of the dogs and persons that we believe to occupy the tunnel. 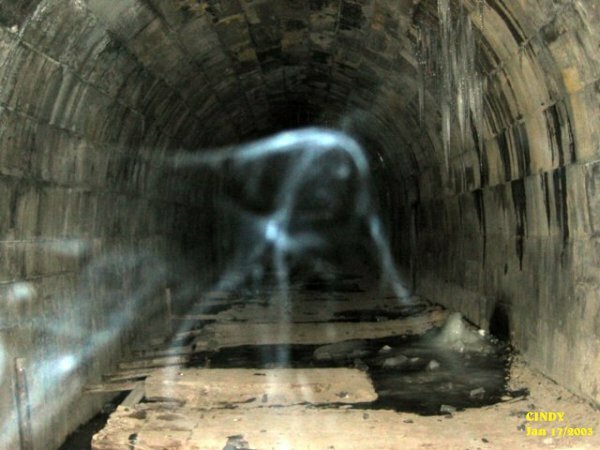 We suspect that there are more spirits that dwell within the tunnel. 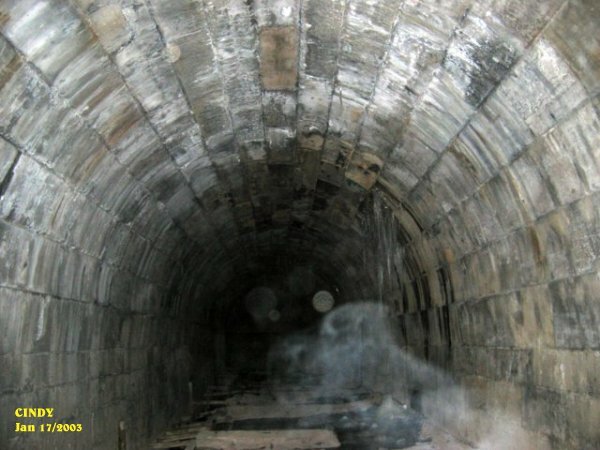 Also there are things within the tunnel that appear that are not of this world.... When you call out the dogs names, a few times you will hear a dog or dogs bark near the tunnel. By calling the persons we know to date, you may experience the feeling of someone grabbing your arm or squeezing your arm. Also you may see a black shadow of a man standing next to you. 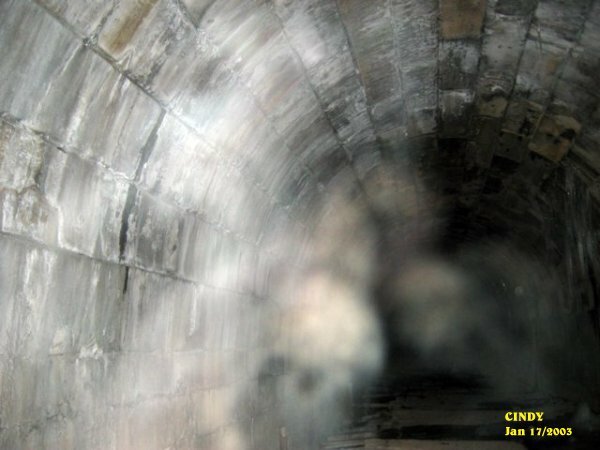 The tunnel has a lot to offer in the way of a paranormal experience. 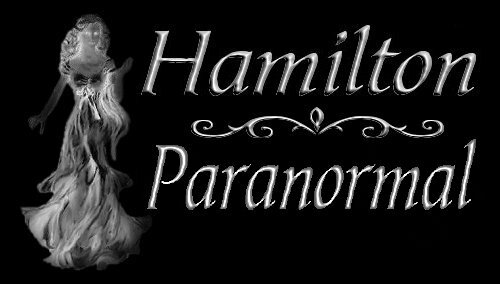 Always go in with an open mind and you just may experience a close encounter of the paranormal kind that cannot be explained.